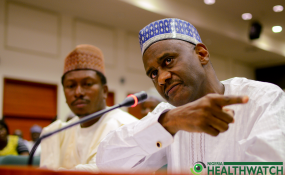 The Abuja head office of the National Health Insurance Scheme (NHIS) was on Thursday thrown into jubilation following the announcement of the suspension of Usman Yusuf. This is the second time in one year that Mr Yusuf, the Executive Secretary of the scheme, will be suspended from office. Mr Yusuf, a professor of Haematology-Oncology and Bone Marrow Transplant, has a reputation for seemingly disrespecting laid rules and constituted authorities at the scheme. Workers said he ran the NHIS with an ‘iron fist’ for the two and a half years he held sway at the saddle. So, when the governing council, which is empowered by the NHIS Act to oversee operations of the scheme, announced his suspension on Thursday, staff and management members sighed in relief. “Our position is that of obvious jubilation because this is an answered prayer. Its a breakthrough,” a top official of the scheme said. “Operations have been hanging, the people where idle. They come to work and cross legs and do nothing from Monday to Friday. This man has shut down operations. Our regional offices around the country are all in jubilation. Its a major deliverance,” the official who asked not to be named for fear of victimisation said. This official’s stance was echoed by Kayode Olawuyi, the Chairman of the Medical and Health workers union, NHIS chapter. “Generally, there is a sense of relief that the man is gone and gone for good”, Mr Olawuyi who doubles as the NHIS Joint Union Chairman told PREMIUM TIMES on phone. Mr. Yusuf, 54, took over the state-run health insurance provider on July 29, 2016 but his reign at the agency has been bedevilled by controversies. He posed as an ‘untouchable,’ said a worker, and on many occasions brazenly disregarded directives from the Minister of Health, Isaac Adewole, who supervises the agency. His controversial reign partially came to a halt last year when Mr Adewole sent him on indefinite suspension over allegations of misconduct and corruption. Thereafter, Mr Adewole asked a panel to investigate the allegations against Mr Yusuf. Although documents in possession of PREMIUM TIMES revealed that the panel indicted him and recommended sanction, President Muhammadu Buhari reinstated the executive secretary seven months later. Since his reinstatement in February this year, the agency has been engulfed in infighting as Mr Yusuf and some senior officials traded accusations of fraud. The NHIS governing council since inception in March has also been confronted by piles of petitions against the official. The council repeatedly rejected the 2018 budget of the scheme over alleged ‘padding’ by Mr Yusuf. Members of the council held several emergency meetings over the crisis. Senior workers at the scheme about a week ago urged the government to ask the embattled executive secretary to step aside after again accusing him of fraud. While announcing his suspension to journalists on Thursday, Enyantu Ifenne, the chairperson of the governing council, said several executive infractions that “we can not ignore” had been observed, noting that the council resolved to suspend Mr Yusuf because it was inundated with petitions and infractions against him. Mrs Ifenne said the council had resolved to set up an administrative panel to examine allegations levelled against Mr. Yusuf. “The panel has three months to complete it’s assignment and report back to us,” she noted. Mrs Ifenne, a pediatrician, also announced that Sadiq Abubakar will act as Executive Secretary in Mr Yusuf’s stead. Before now, Mr Abubakar was the General Manager in the scheme’s legal department. The council in a statement after the press briefing listed eight major infractions against Mr Yusuf. The board chairperson later explained to this newspaper that insubordination was one of the infractions. PREMIUM TIMES contacted Mr Yusuf’s known official line. “This is the wrong number, it is not the right number Ok”, a man’s voice said to this reporter after formal introductions. SMS and Whatsapp messages forwarded to the same line drew no response, although officials in the scheme confirmed the number is that of Mr Yusuf. The NHIS was tainted by graft and sharp practises even before Mr. Yusuf took over as the head in 2016. In fact, many described the arrangement of the scheme as skewed against the people. It was because of what Nigerians go through in the quest for often expensive medical care that brought about the establishment of NHIS. The scheme made it possible for the insured to seek immediate care whenever there is imminent need to see a physician. The scheme was set up to ensure financing of health care costs and management for Nigerians through the pooling and judicious use of financial resources to ensure cost burden sharing for patients through pre-payment mechanism. It has, however, been enmeshed in several controversies. Since its establishment 13 years ago, the number of Nigerians covered by the scheme is about 1.5 per cent of the population. Most of the beneficiaries are civil servants and corporate workers in the private sector.